Since you likely find the brilliant outfits of stylish civilians as fascinating as we do, we partnered with Pose. to bring you a street style slideshow of giant proportions. Scroll down for our favorites, and let us know in the comments which ones you're planning to copy. For even more outfit ideas follow Who What Wear on Pose for fashion inspiration straight from WWW headquarters. See more ways to wear shift dresses on Pose.com. Modernlegacy is wearing: Toi Et Moi dress; Converse sneakers; MyLeather bag; Celine sunglasses. Vonvogue is wearing: H&M T-shirt; Zara pants; Le Chateau sandals. See more ways to wear sheer tops on Pose.com. Theaugustdiaries is wearing: Mango blazer. See more ways to wear black blazers on Pose.com. Balamoda.net is wearing: Forever 21 T-shirt and pants. See more ways to wear graphic tees on Pose.com. See more ways to wear mesh shirts on Pose.com. Jessannkirby is wearing: J. Crew shirt; Joes Jeans jeans; Sole Society heels. See more ways to wear flannel shirts on Pose.com. See more ways to wear quilted bags on Pose.com. Friendsrfashion is wearing: Zara jumpsuit; RPZN sunglasses. See more ways to wear mirrored sunglasses on Pose.com. 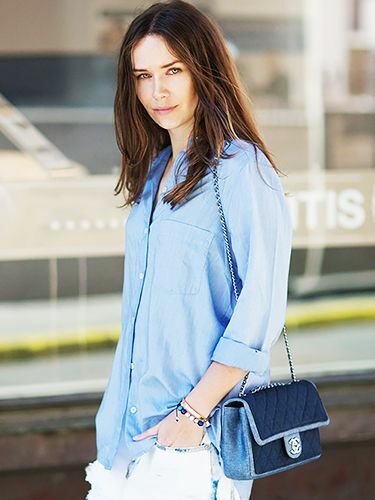 Margoandme is wearing: Gucci purse. See more ways to wear red cross-body bags on Pose.com. Alisialynn is wearing: Zara dress; Swedish Hasbeens heels; Anthropologie bag; Madewell sunglasses. See more ways to wear clogs on Pose.com. See more ways to wear structured jackets on Pose.com. Stylemegrasie is wearing: Zara jacket; Greylin T-shirt; J Brand jeans. See more ways to wear flare jeans on Pose.com. Vonvogue is wearing: Free People shirt; H&M T-shirt; Zara shorts and sandals. See more ways to wear white T-shirts on Pose.com. Kattanita is wearing: Rails shirt; James Jeans skirt; Stuart Weitzman heels; Mansur Gavriel shoulder bag. See more ways to wear jean skirts on Pose.com. Jessannkirby is wearing: Forever 21 skirt; Talbots sandals. Catchingcouture is wearing: Anagram By Gary Graham dress; Aldo heels. See more ways to wear white dresses on Pose.com. Imsheridanicole is wearing: Choies Dress; Dolce Vita sandals; Target sunglasses. See more ways to wear printed maxi dresses on Pose.com. See more ways to wear jersey dresses on Pose.com. Stilettobeats is wearing: Nasty Gal blazer; DeLacy skirt; ShoeMint heels. See more ways to wear bralettes on Pose.com. Heyimkate is wearing: ASOS jeans; Aldo heels. Divinemlee is wearing: Uniqlo shirt; Topshop pants; Zara heels. See more ways to wear pinstripe skirts on Pose.com. Friendsrfashion is wearing: H&M jacket. See more ways to wear trenchcoats on Pose.com. Vonvogue is wearing: Tommy Hilfiger shirt, shorts, and sandals. See more ways to wear striped button-downs on Pose.com. Michelletakeaim is wearing: Raquel Allegra dress; Birkenstock sandals; Ian Kafoury clutch. See more ways to wear Birkenstock sandals on Pose.com. Honeynsilk is wearing: Three Of Something dress. See more ways to wear white maxi dresses on Pose.com. Imsheridanicole is wearing: Forever 21 blouse; Nordstrom skirt; Sole Society heels; Tom Ford sunglasses. See more ways to wear printed pencil skirts on Pose.com. Michelletakeaim is wearing: Little Mistress dress. See more ways to wear fur vests on Pose.com. Loveandlace is wearing: The Line And Dot sweater; Cotton On shorts. See more ways to wear knit sweaters on Pose.com. Coidejesus is wearing: Mango shirt; Forever 21 shorts; AK Anne Klein scarf; Thrifted cross body bag. See more ways to wear white blazers on Pose.com. Jenagambaccini is wearing: Asos shirt and shorts; Ancient Greek Sandals sandals; Illesteva sunglasses. See more ways to wear white shorts on Pose.com. Stylespectra is wearing: H&M tank top; Zara bag. See more ways to wear printed pants on Pose.com. 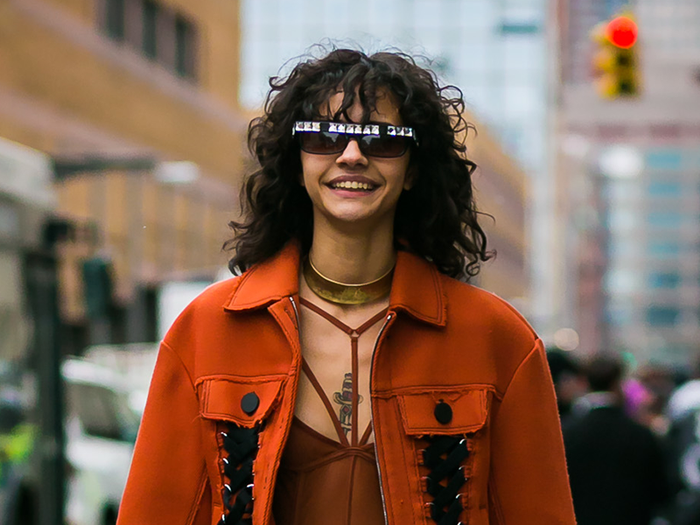 Jenagambaccini is wearing: Mugler jacket; Sunday Somewhere sunglasses. See more ways to wear retro sunglasses on Pose.com. Margoandme is wearing: Peggy Hartanto blouse and shorts. See more ways to wear color-block tops on Pose.com. Dashofdarling is wearing: ASOS shirt. See more ways to wear striped shorts on Pose.com. Stilettobeats is wearing: Dashiki jumpsuit. See more ways to wear printed jumpsuits on Pose.com. Karamode is wearing: Zara blouse and skirt. Stylespectra is wearing: & Other Stories Dress. See more ways to wear striped dresses on Pose.com. Friendsrfashion is wearing: Gap shirt and shorts; Aldo heels. See more ways to wear chambray shirts on Pose.com. Adoretoadorn is wearing: Nordstrom loafers; Loeffler Randall bag. See more ways to wear metallic loafers on Pose.com. Heleneisfor is wearing: South Parade T-shirt; H&M skirt; Vince sandals; Suburban Riot tote; Dorfman Pacific hat. See more ways to wear pencil skirts on Pose.com. Thestyleeditrixis wearing: Michael Stars blouse; Joes Jeans shorts; Just Fab heels. See more ways to wear jean shorts on Pose.com. Topitoff is wearing: Anthropologie shirt; Madewell shorts; Gap sandals; J. Crew bag; Madewell sunglasses. See more ways to wear strappy sandals on Pose.com. Shopsavesequins is wearing: ASOS dress; Brian Atwood Flats; Kate Spade bag; Target sunglasses. See more ways to wear printed dresses on Pose.com. Thestylemartini is wearing: H&M T-shirt; Mango skirt; Bimba Y Lola flats; Michael Kors bag; Yves Saint Laurent sunglasses. See more ways to wear black and white on Pose.com. Thesignaturebow is wearing: C.O.S dress; Birkenstock sandals; Le Specs sunglasses. See more ways to wear T-shirt dresses on Pose.com. Topitoff is wearing: H&M shirt; Old Navy skirt; J.Crew bag; Windsor hat; Madewell sunglasses. See more ways to wear maxi skirts on Pose.com. Veronicapopoiacu is wearing: ASOS jumpsuit and sunglasses. See more ways to wear jumpsuits on Pose.com. So, are you inspired? What outfit are you going to try? Let us know in the comments below!